Turns out there’s a Bar Harbor on Mars. An Acadia, too. Mainers like to say you can’t get there from here. 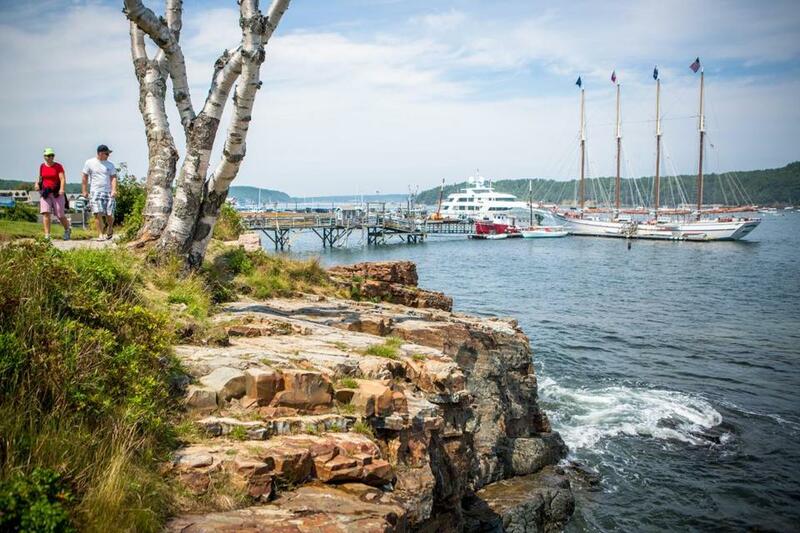 But when it comes to the new Bar Harbor, it actually is true. 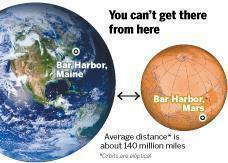 This Bar Harbor is tens of million miles away — on Mars. It’s the informal name of a neighborhood on the red planet that a NASA scientist has affectionately filled in, along with other salty Maine place names, including Squid Cove, Lobster Mountain, Old Soaker, and Ogunquit Beach. 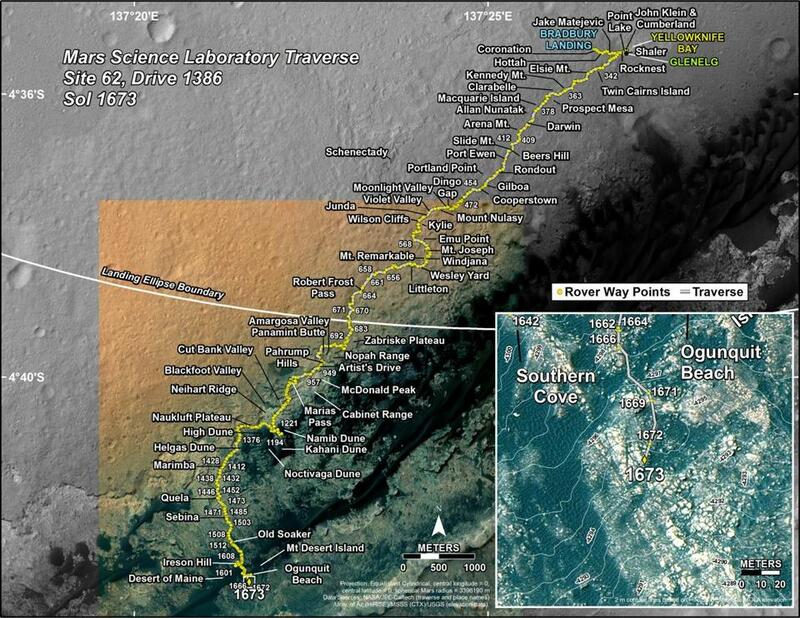 The Mars versions are the places on the planet that the Curiosity rover began exploring last year. A NASA geologist, Dr. Katie Stack Morgan, settled on the names by reaching back to childhood memories of summers in Bar Harbor and Acadia National Park. She and a colleague, Dr. R. Aileen Yingst, a Maine resident who works out of her home in Brunswick, began plumbing the Maine atlas to name significant geologic features the Curiosity rover has identified in its exploration of the area. Some 300 rocks, dunes, and outcroppings now carry such colorful Maine stops as Burnt Porcupine and Aunt Betty Pond, as well as more traditional destinations like Boothbay Harbor and Mount Desert Island. Ogunquit Beach, for example, is part of a sand dune field where the rover took a soil sample, and Lobster Mountain is a mesa that features signs of ancient lakes. Bar Harbor (on Mars, that is) is one of many small areas measuring 1.5 kilometers by 1.5 kilometers that NASA has sectioned off to help organize its Mars exploration. Curiosity has explored nine of the named quads so far, and they’ve been dubbed with place names here on Earth, including Yellowknife, after a city in northern Canada; Kimberley, for the city in South Africa; and Arlee, for a community in Montana. Yingst named one of the quads Hanover, after the New Hampshire hometown of her alma mater, Dartmouth College. Curiosity explored the Hanover area of Mars in 2014, and scientists naturally gave its features names from the Granite State, including a sandstone formation called Winnipesaukee, iron meteorites dubbed Lebanon and Littleton, and a valley that Curiosity traversed now known as Robert Frost Pass. A map shows the route the Curiosity rover has traveled in its exploration of Mars, including “Bar Harbor,” with Maine-themed landmarks marked at bottom. Way back in 2009, an earlier Mars rover, Opportunity, found a meteorite that scientists named after Block Island. Yingst said two other quads that have yet to be explored by Curiosity may be named after locations in Massachusetts: Quincy and Squantum. Yingst, a principal investigator who helps oversee the rover’s camera systems, said New England is well suited as the originator of the new Mars labels because of its mountains, coasts, and other geologic features. All these places are not official names of Mars locations; official designations for places in space are made by the International Astronomical Union, which represents professional astronomers. For now, though, the scientists are using them in studies, presentations, and reports, Morgan said. ”They have worked their way into the scientific nomenclature. These are names we will be using for years and years to come,” said Morgan, who grew up in Connecticut and lives in California, but still spends her summer vacations in Maine with her family. A couple walked the Shore Path in Bar Harbor, Maine.